"Before the reader is introduced to the modest country medical practitioner who is to be the chief personage of the following tale, it will be well that he should be made acquainted with some particulars as to the locality in which, and the neighbours among whom, our doctor followed his profession." Good, dependable Doctor Thorne, our esteemed doctor of Greshambury, lives with his young niece named, Mary. Yet there is a secret around Mary's birth that few people know; she is the illegitimate daughter of Doctor Thorne's older brother and the sister of Roger Scatcherd, a former poor stonemason and prison inmate, who has amassed a fortune that makes him the rich owner of a large estate. The ruling family, the Greshams, accept Mary's company and she is friends with some of the daughters, but when it is learned that Frank, the only son, is in love with her, she becomes persona non grata and is ostracized from their company. A lively plot begins as Frank is determined to marry Mary, Roger Scatcherd is determined to drink himself to death, an inheritance is unclear, and society struggles to maintain its traditional structure. As much as I enjoyed this book, there were a few disappointments, as well. Because this novel was serialized, I found the pacing somewhat inconsistent, which took away a little bit of the enjoyment. After building up slowly with the characters and their situations, Trollope suddenly had nearly a year pass by, a declaration, and then another year was gone, all in the space of a few dozen pages. My second disappointment dealt with the plot itself. One aspect that I enjoy about Jane Austen's writing, for example, is her ability to take a traditional situation and explore possibilities just outside of that tradition. 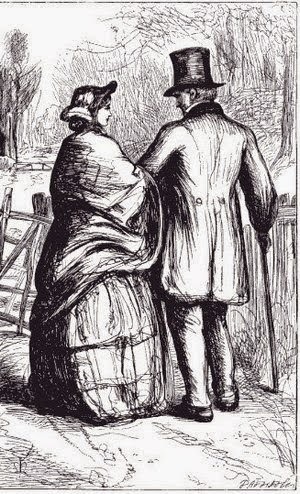 Trollope lulls the reader into expecting the same, yet at the end of the tale, tradition wins out: Scatcherd is shown as an example of what can happen to those who try to rise above their station, Mary becomes an heiress, she marries Frank, and everyone is happy only because convention is followed. Well, I say, "bah!" to convention! While I realize departing drastically from societal norms wouldn't be believable, one would think that Trollope could have challenged convention in a plausible way that would have made the story more intriguing. But ultimately money remains the commodity that is worshiped, everyone is happily kept in their social positions, with the same perceptions and the same prejudices, and with nothing unusual or radical to stir them out of their complacency. Bah! 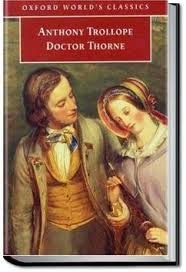 Perhaps you are wondering why I have barely mentioned Doctor Thorne, who bears the prestigious title of the novel. Well, curiously, the tale revolves around many characters other than Doctor Thorne. But while the action circulates around these characters, his importance in this tale is inescapable. He is the respected thread that holds the neighbours together, the good sense in the quandry, the steadying force in the chaos. He is like the eye of the hurricane, a calm centre while everything else blows in a whirlwind around him. His tranquil, composed demeanor and sincere warmth and compassion never falter. In this I can agree with Trollope; he was certainly the hero for me. The next book up is Framley Parsonage. So far my favourite is still The Warden but, with three more to go, a new favourite is not out of the question! Great review! I haven't finished this one yet (although I know the ending, so no concerns about spoilers)! I am so enjoying this set of books, though! I should easily be done with Dr. Thorne to start Framley Parsonage in November. Thanks, Christine! There weren't very many twists and turns to this one but it was a lovely story. I don't think I'll be starting Framley Parsonage until December at the earliest, possibly January, so you will in all likelihood overtake me. I'll keep looking for your review! I did llike Doctor thorne. If you want something that doesn't follow convention, get to The Small House --that will do it! Oh, now I'm intrigued! Trollope has kept everything very status quo, so far, so I'd like to see him break out of that mold a little. Trollope, I've never read him. Your review was insightful and with a whiff of criticism, J' aime bien! How many books are in the AT series? I guess I am reading Trollope out of order. I started with "The Way We Live Now" and am now working my way through the Pallisers, planning to double back to the Barsetshire series after that. So far I have noticed that tradition generally does win out in his novels although in some he does push the limits of the stiff Victorian walls.In "Can You Forgive Her?" I got a sense of just what women in that period were up against. The pressures to conform were more than most normal people could defy. I don't think that you have to read Barsetshire before the Pallisers, but I understand that the Barsetshire series is considered slightly "easier" reading than the Pallisers, so perhaps that's why many will read that series first. It's more realistic that tradition wins out, isn't it? I was hoping for something different but I'm sure both Mary and Frank were very happy with the culmination of their story. I'm pretty sure they wouldn't have wanted it any other way and it's only me who was wishing that the envelope was pushed a little. Actually it's a little refreshing that we have an author who does stay within the bounds of convention; it's probably more unusual than not. I've Read the Warden and Barchester Towers but ages and ages ago. I was just thinking I should do a Trollope read. Thanks for the review. You're welcome! I find Trollope a very different writer than most I've read before. I know that he's compared to Dickens but for me there are few similarities. I find his writing quite soothing and his books perfect for a relaxing day (or few hours) of reading. I hope you enjoy Doctor Thorne, Faith. Thanks for stopping by! Share book reviews and ratings with Cleo, and even join a book club on Goodreads. What Ho! For a Lunatic! Copyright: Cleo and Classical Carousel, Years 2014 - 2019. Unauthorized use and/or duplication of this material without express and written permission from this blog’s author and/or owner is strictly prohibited. Excerpts and links may be used, provided that full and clear credit is given to Cleo and Classical Carousel with appropriate and specific direction to the original content. Trying to get through as many classics as I can before I die, and hoping to share part of my journey.